The next meeting of the London-Paris Romanticism Seminar will take place on Friday 26 April in the Bloomsbury Room (G35, ground floor) at Senate House, University of London, starting at 5.30. As our distinguished guest speaker, we are delighted to welcome Professor Frances Ferguson of the University of Chicago, who will present a paper entitled Anna Letitia Barbauld, the Book, and the World. This will be followed by a discussion and wine reception. The event is free and open to everyone, including postgraduates and members of the public. No booking is required. Written by Romanticism editor, Nicholas Roe. The 25th publishing anniversary of Romanticism offers an opportunity to reflect on the origin of the journal three decades ago. In the mid-1990s there was no UK-based journal dedicated to publishing a broad range of essays, articles and reviews in the Romantic field. There were specialised journals, some of them of remarkable longevity such as the Keats-Shelley Memorial Bulletin and the Byron Journal. The Review of English Studies and Essays in Criticism published essays on Romantic literature from time to time alongside other material. In the US there were the Keats-Shelley Journal, Blake Quarterly, The Wordsworth Circle, and other author-focused publications, as well as the prestigious and long-established Studies in Romanticism. There seemed to be a gap for a new UK-based scholarly journal that would publish the most significant new critical and scholarly work in the field, with a reviews section dedicated to longer reviews of new work in the field. 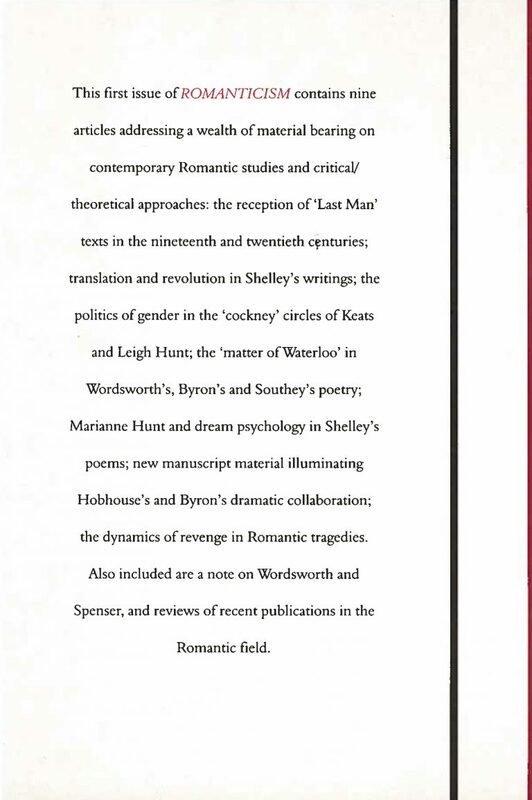 Back cover of the first issue of Romanticism (1995).